One of the earliest Jewish settlers at New Amsterdam (New York). He arrived at that port on the ship "Pear Tree" July 8, 1654, it is believed from Holland, which country he seems to have left in company with a coreligionist named Jacob Aboab (Aboast or Aboaf? ), also bound for New Amsterdam. It is doubtful whether Aboab ever reached the New World. Early records refer to some transactions between these emigrants when their vessel was off the Isle of Wight; hence, in view of the date and the circumstances, the Dutch origin attributed to these early emigrants. 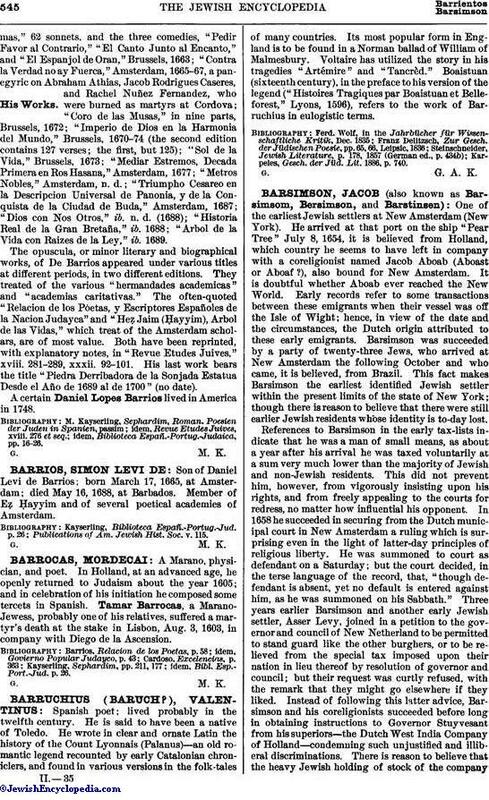 Barsimson was succeeded by a party of twenty-three Jews, who arrived at New Amsterdam the following October and who came, it is believed, from Brazil. This fact makes Barsimson the earliest identified Jewish settler within the present limits of the state of New York; though there is reason to believe that there were still earlier Jewish residents whose identity is to-day lost. 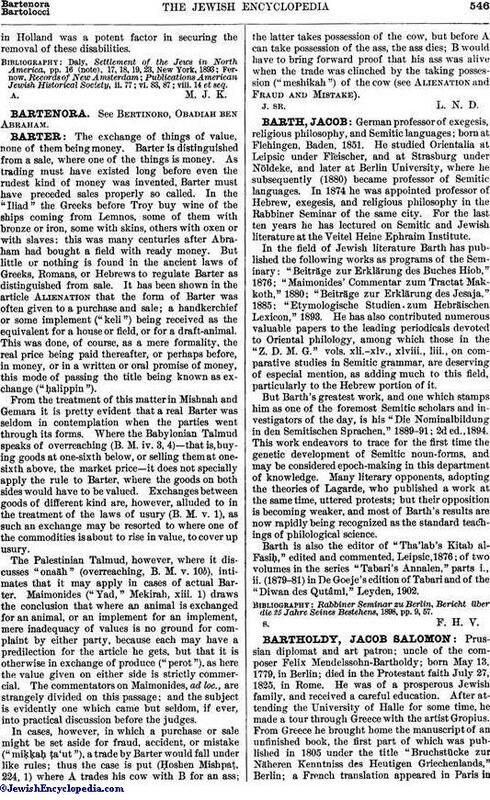 References to Barsimson in the early tax-lists indicate that he was a man of small means, as about a year after his arrival he was taxed voluntarily at a sum very much lower than the majority of Jewish and non-Jewish residents. This did not prevent him, however, from vigorously insisting upon his rights, and from freely appealing to the courts for redress, no matter how influential his opponent. In 1658 he succeeded in securing from the Dutch municipal court in New Amsterdam a ruling which is surprising even in the light of latter-day principles of religious liberty. He was summoned to court as defendant on a Saturday; but the court decided, in the terse language of the record, that, "though defendant is absent, yet no default is entered against him, as he was summoned on his Sabbath." Three years earlier Barsimson and another early Jewish settler, Asser Levy, joined in a petition to the governor and council of New Netherland to be permitted to stand guard like the other burghers, or to be relieved from the special tax imposed upon their nation in lieu thereof by resolution of governor and council; but their request was curtly refused, with the remark that they might go elsewhere if they liked. Instead of following this latter advice, Barsimson and his coreligionists succeeded before long in obtaining instructions to Governor Stuyvesant from his superiors—the Dutch West India Company of Holland—condemning such unjustified and illiberal discriminations. There is reason to believe that the heavy Jewish holding of stock of the companyin Holland was a potent factor in securing the removal of these disabilities. Publications American Jewish Historical Society, ii. 77; vi. 83, 87; viii. 14 et seq.